Recently, the NEJL received a wonderful donation of brochures and posters from Pat A. Silbert, who was the Assistant Art Director of the OEO. 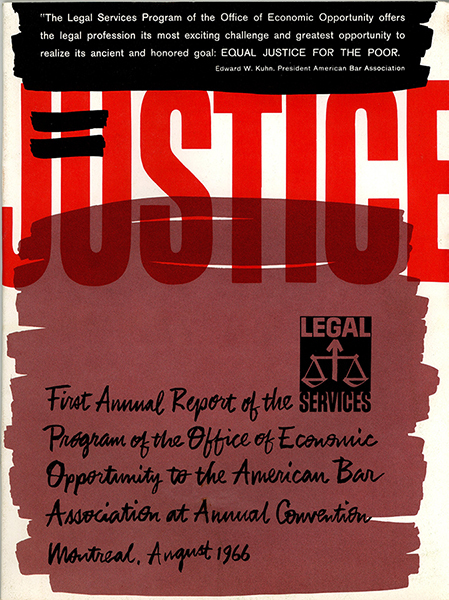 Silbert designed many of the remarkable posters and brochures for the legal services program, including the stunning cover of the first annual report of the OEO-Legal Services program to the ABA in 1966. Silbert also worked as a graphic designer for the LSC and designed all annual reports of the LSC from 1976-1981. She also took many of the photographs in LSC’s first reports. Silbert’s intelligent, bold, modern graphic design captured the essence of the dynamic legal services program that emerged in the 1960s. Pat Allott (Silbert) and Peter Masters at work on the Profile on Poverty exhibition, 1965. Photo donated by Pat A. Silbert. 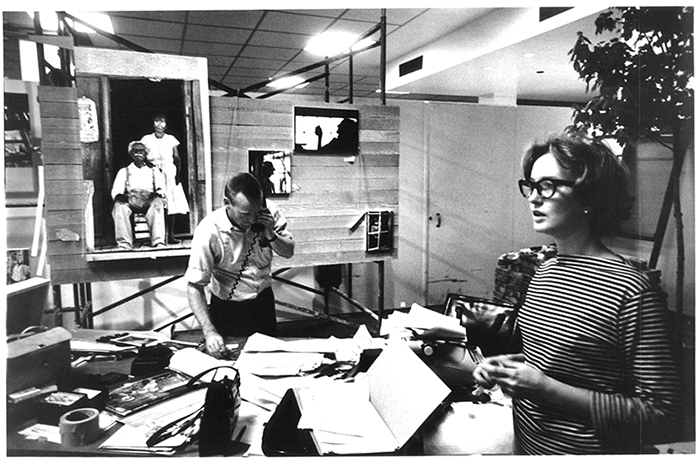 In a biographical sketch, Silbert recalls how she walked into the office of OEO’s Art Director, Peter Masters, in 1964, determined to work for the new agency. Masters told her that they would not get paid until they received the first appropriation from Congress. However, they worked day and night, and loved the work. When she finally got paid, her salary was much larger than at the advertising agency where she had previously worked. “At the time, the Federal Government was the only employer that did not discriminate in pay against women,” she writes. Since the OEO was a new government agency, they could do things somewhat “more innovative than at other agencies.” Among her projects was the major Profiles of Poverty exhibit at the Smithsonian Museum of History and Technology, which featured over a quarter million photographs by more than 100 photographers. Silbert also donated photographs showing her working at the exhibit, and from the opening of the exhibit with Hubert Humphrey and Sargent Shriver. Shriver greatly valued Silbert’s work, and her collection includes reproduction of several notes of appreciation from him, as well as from Gary Bellow and Hubert Humphrey. Silbert graduated from the Corcoran School of Art and, after working at the OEO, worked as a freelance graphic designer in the DC area, where she also worked for the LSC. She then turned to painting full-time, and is currently a partner at Waverly Street Gallery in Bethesda. The Pat A. Silbert collection is available at the NEJL. This entry was posted in acquisitions, General, History of Legal Services, War on Poverty anniversary on March 29, 2018 by Katharina Hering. In the spring of 1968, the Poor People’s Campaign submitted a list of demands to the Office of Economic Opportunity. Key demands included participation of citizens, especially from low income communities, in OEO’s policy making processes: “We demand that the OEO reorder its priorities so that the consumers of services be involved in the policy making, the technical assistance, and employment (…) of those programs which continue to be administered by the agency.” The PPC also demanded more oversight and accountability of the OEO programs. The memo, which is part of the Alf Corbett papers (NEJL043) and marked in Corbett’s handwriting, includes a draft response by the OEO to these demands. This entry was posted in General on March 29, 2018 by Katharina Hering. The original recording was on an undated VHS tape, which was part of the NLADA audio-visual collections. Clint Bamberger at the NEJL, ca. 1997. Photograph by Hilary Schwab. Clinton Bamberger Papers, NEJL, GULL. I first met Clint Bamberger over 52 years ago, in early October 1965. He had invited me to lunch at a downtown DC restaurant. I was immediately struck with his ruddy complexion and shock of blond hair, and especially his rich baritone voice that a news anchor would have killed for. Clint had only been installed as the Director of this brand new OEO Legal Services Program a couple of weeks earlier. Thus, the avowed purpose of our luncheon was for him to learn more about the experimental Neighborhood Legal Services Project I had been working in the past year. He wanted to know how the diversified neighborhood model was working, whether it was possible to make it a unified program rather than a collection of tiny law offices, and generally the pros and cons of this approach to delivering legal services to the poor. Two days later, I found out this meeting actually had been a job interview. Clint called and asked if I would sign on as his deputy director. I would have said yes to the offer anyway, but I had left our luncheon highly impressed with Clint and so was honored and excited about the opportunity of working with him. Although he had told me a bit about his background as a corporate lawyer in Baltimore, it was many years later that I first learned the story of how he had left that practice to take on the job of heading a program for poor people. He had joined the Baltimore firm, Piper and Marbury, in 1952, as the thirteenth lawyer in what was then the second largest law office in that city. It should be noted that, many mergers and acquisitions later, that firm is now DLA Piper, with over three thousand lawyers and 50 or 60 offices spread across the globe. Yet, while defending insurance companies was his day job, he was an active member of the board of the local legal aid society, and also taking on pro bono cases for criminal defendants. One of the latter was the appeal of John Leo Brady, a convicted murderer on death row. Brady, who had no prior criminal record, had joined with three others in a robbery plot that led to the death of the robbery victim. All four defendants were convicted of felony murder, but Brady was also convicted of actually murdering the victim and thus given the death penalty. In reviewing the record, Clint discovered that while two of the conspirators had given statements that Brady had been the killer, the third had confessed he not Brady was the one who had committed that act. But this exculpatory evidence had not come out at trial because the prosecution had not turned over that third confession to defense counsel. The failure to do so became the centerpiece of Clint’s appeal to the Maryland Court of Appeals, which reversed the death penalty but not the felony-murder conviction. Clint petitioned the U.S. Supreme Court and argued the failure to turn over the co-conspirator’s confession infected the entire case against Brady. 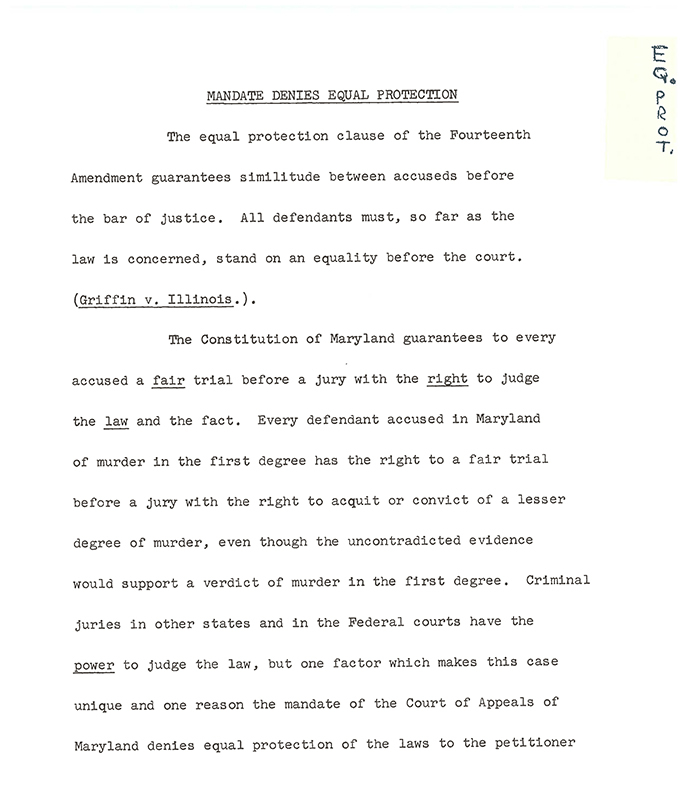 Excerpt from Bamberger’s Brady v. Maryland Supreme Court argument , typescript, Clint Bamberger papers, box 6, NEJL, GULL. Clint was always careful to admit he lost the case in the U. S. Supreme Court because the justices affirmed the Maryland appellate court’s decision that the felony murder conviction remained standing. But if so, it was the opposite of a pyrrhic victory; it was a glorious loss. The U.S. Supreme court for the first time held that the prosecution’s failure to turn over exculpatory evidence was reversible error. Hence the “Brady rule” was born. The decision was good for Brady, too, who was paroled two years later. He and Clint exchanged Christmas cards and messages every year thereafter. This case in particular and his other pro bono work for poor people in general was more satisfying for Clint than all his highly paid representation of Piper and Marbury’s corporate clients. But in the summer of 1965, Clint was still a corporate lawyer, an up-and-coming partner in Piper and Marbury. In August of that year, the ABA held its annual meeting in Miami with Sargent Shriver as a featured speaker. As a board member of Baltimore’s tiny 2 lawyer legal aid society, Clint saw an opportunity to learn more about this incipient OEO Legal Services Program he hoped might supply some much needed funding for that struggling organization. So he traveled to Miami to attend the session on the legal services program that Shriver keynoted. In that speech, Shriver apologized profusely for the long delay in starting the program the ABA had endorsed six months earlier at its midyear meeting. Unfortunately, the program’s start had been held up by the failure to find a suitable director to head it up. So no staff, no policies, no organization to solicit or make grants. 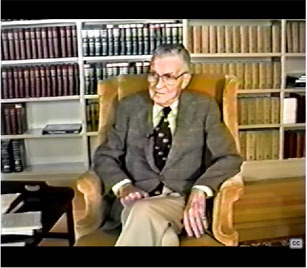 Screen shot from 1992 oral history interview with Howard Westwood, conducted by Clint Bamberger. The meeting ended on that note and both men went their ways. But Westwood finally had picked his man. He reached out to all the relevant ABA leaders and soon Shriver was barraged with messages about the virtues of E Clinton Bamberger, Jr, a man none of them knew personally. So, Clint was startled when a couple of weeks later, Shriver called and invited him to come to OEO to learn more about the job Clint doubted he wanted or would accept. But he had underestimated Shriver’s powers of persuasion and the opportunity the War on Poverty’s commander pointed out for Clint to do something that would make a real difference to American society and the lives of its poorest citizens. By the time Clint left Washington to return home he had decided he would take the job, after all. On September 24, 1965, he arrived at OEO headquarters a second time, on this occasion to start working as the first director of the OEO Legal Services Program. After Shriver greeted him, Clint was ushered to a small suite of offices, devoid of staff and almost devoid of furniture, that would be the headquarters of the program for the next several years. 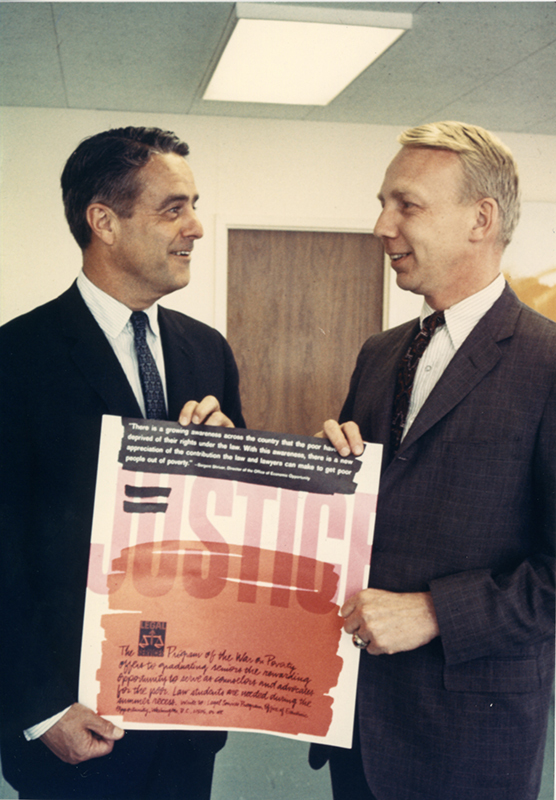 Clinton Bamberger and Sargent Shriver, 1966, with poster for the OEO Legal Services Program. The poster was designed by Pat Silbert. Photographer: unknown. Clint Bamberger Papers, NEJL, GULL. When I joined the OEO Legal Services staff in mid-October, 1965, Clint was in the midst of staffing up the headquarters and the seven regional legal services offices. Long before the big firms and the legal profession recognized the lack of diversity as a problem, Clint was determined to assemble a staff that was not all white males. Three of the seven Regional Directors he picked were African-American lawyers and three of the professionals on the headquarters staff were women. When the staff expanded a bit in early 1966, Clint added another woman, Barbara Yanow—incidentally, for the past 47 years my wife. Clint’s biggest challenge in those early days was to create demand—that is, to find and encourage organizations or individuals to put together proposals that OEO could fund. By this time there was a little over seven months left in the fiscal year—which in those days ended on June 30–to receive, consider, and fund the 15 million dollars worth of grants Shriver had allocated to our program. The largest potential pool of applicants for OEO funding was found among the existing legal aid programs– but only if they could be induced to make the many changes in design and function that the program’s policy Guidelines required. And the crucial body for reaching those existing societies was, yes, the National Legal Aid and Defender Association, which conveniently was holding its annual meeting in mid-November, 1965, in the city of Scottsdale, Arizona. Excerpts from Clint Bamberger’s address at the NLADA meeting in Scottsdale, Arizona, November 18, 1965. Clint Bamberger papers, NEJL, GULL. Clint was scheduled to answer questions after lunch, but before he could start that session, the executive director of the Washington legal aid society took over where his board chair had left off in criticizing the incipient OEO Legal Services Program. After that renewed assault, Clint took the podium to take on all comers. It proved to be both an ordeal—some four hours in duration—and a triumph. As a trial lawyer, he had been a crossexaminer, but now he was the crossexaminee. And in that role, he proved to be the perfect witness. Never flustered, always in command, with answers that disarmed and often convinced the questioner, and nearly always gained some applause or heads shaken with approval. By the end of the afternoon, you could sense he had turned the tide. The next day he and I were meeting with scores of delegations from legal aid societies eager to apply for OEO grants. What followed was six months of 14- hour days, six and sometimes seven days a week, for Clint and his staff. Clint proved to be not only a powerful speaker but a natural leader—full of good ideas, a clear vision of where the program should go, working hard and inspiring others on the staff to do the same. 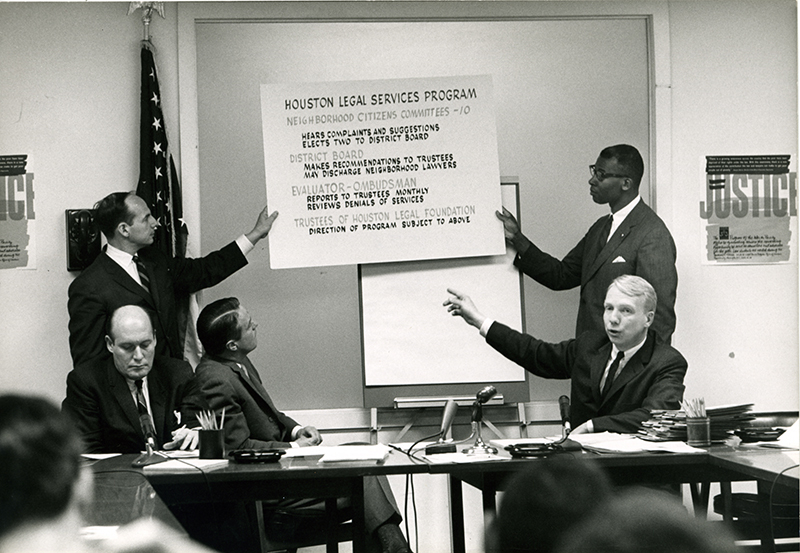 Clint Bamberger at a press conference announcing the Houston Legal Services Program, April 1966: Photographer unknown. Clinton Bamberger Papers, NEJL, GULL. Largely because of what Clint accomplished that day at the NLADA and the months thereafter, we exceeded our goal of funding 75 legal services programs and giving out 15 million dollars in grants. Clint proved a persuasive advocate within OEO as well as elsewhere and Shriver upped the budget commitment to the Legal Services Program. Thus, by the end of the fiscal year we had approved 130 grantees and committed over 20 million dollars to those grants – which is nearly 150 million in 2017 dollars. By June, 1966, Clint felt he had accomplished all that he had been hired to do as OEO LSP director. So he accepted an opportunity to run for Attorney General of Maryland. So he resigned from OEO and returned to Baltimore, leaving me as the program’s acting director and shortly thereafter its second director. When he lost the election, Clint returned to Piper and Marbury for a few years, but his heart was elsewhere. He accepted a seat on the National Advisory Committee to the OEO Legal Services program, where he was of its most influential and helpful members, always in support of the aggressive agenda he had advocated as the program’s director. Then in 1970, when Father Drinen headed up the search committee for the deanship at Catholic University Law School they offered Clint that job and with permission to make school more socially relevant. Clint jumped at the chance. Catholic soon had one of the most ambitious and innovative clinical programs in the country. This program served the poor of Washington, D. C. in several ways, including Clint’s favorite, campaigning against lead-based paint that threatened the health of poor children across the District. During his tenure as Catholic Law School dean, Clint also served on the NLADA board, including a term as Board President. In those years, NLADA was transformed—moving its headquarters from Chicago to Washington, and replacing its long-time executive director with Frank Jones, formerly a deputy director of the OEO Legal Services Program. In 1975, Clint walked a tortuous path back to the national scene. It began innocently enough when he spent his sabbatical as a visiting professor at Stanford Law School. The Stanford Dean at the time was Tom Ehrlich, and he and Clint soon became close friends—bonding over the trials and tribulations and occasional triumphs of being a law school dean. Then appeared on campus another law school dean, Sam Thurman, the Legal Services Corporation board member who was chairing the search committee. Thurman was there to interview Clint who was one of the four finalists for appointment as LSC first President. In the course of his visit, Thurman also had the opportunity to meet and talk with Ehrlich. Later, it became clear the four initial finalists were too tainted by their connection with OEO to pass muster with an LSC board that had been chosen by a Republican president. On the other hand, Thurman had been struck with Dean Ehrlich’s leadership potential and with his absence of the OEO taint. So he soon called Ehrlich and asked if he would be willing to have his name thrown in the hat. Ehrlich said he wouldn’t do so unless the other four candidates agreed it would be OK if he did so. Ehrlich met with Clint and asked for his approval. Clint gave a ready yes, knowing full well he was looking at the first President of the Legal Services Corporation. “I’m sorry, but I can’t take the job without Clint.” Ehrlich said, which required some courage, given the fact he had resigned his Stanford deanship, sold his home there, and moved his family to DC. The board meeting dragged on and on. Ehrlich had to cancel Justice White and call off the reception. Finally, late in the evening, the missing board member arrived. It turned out to be Revius Ortique. He had served on the National Advisory Committee to the OEO Legal Services Program when Clint was director. Predictably, Ortique broke the tie in the obvious direction and the Ehrlich-Bamberger team was confirmed. They celebrated that night ,at Clint’s home rather than in the planned ceremony and reception. 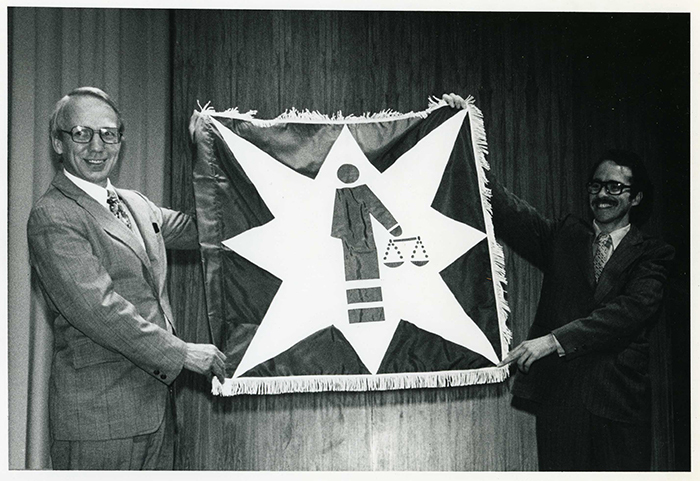 Clint Bamberger receiving a legal services flag on his birthday by LSC staff, summer 1977 or 1978. Photographer unknown. Clinton Bamberger Papers, NEJL, GULL. Clint spent the next four years as Ehrlich’s partner running the Legal Service Corporation during its formative policy-making era and the vast expansion that followed as the corporation pursued its “minimum access” strategy. During that period, they managed to more than quadruple the LSC budget and fill the huge gaps in service availability in the South and plains states. Tom Ehrlich recently told me he and Clint picked the staff jointly, and made most important decisions jointly. Meantime Alan Houseman told me Clint took a special interest in the Research program Alan headed and the work of the support centers, the national clearinghouse, the national training program, and the Reginald Heber Smith Fellows. He also played a leadership and coordination role with the corporation’s senior staff, convening meetings of that group at his home. I strongly suspect the Legal Services Corporation would not have been as successful nor its grantees as productive during those early years had Clint not been its Executive-VP. The next step in Clint’s trajectory from front line corporate lawyer to front line poverty lawyer came when he left LSC to join the running the National Legal Services Institute at Harvard. This was a new ambitious clinical program which turned the entire third year of law school into clinical work serving poor people while educating the next generation of poverty lawyers. Clint had long admired Gary Bellow. This opportunity to work with him and Gary’s wife, Jeanne Charn, on an exciting new program that allowed Clint to work directly on clients’ cases was irresistible. Not that it wasn’t a big step—similar to a general giving up his command to be a platoon leader on the front lines. But he was ready to go back to being a lawyer, and to be the kind of lawyer for the poor he had asked all legal aid lawyers to be in that NLADA speech in 1965. The three years at Harvard proved perfect preparation for the next and final step in Clint’s transition from corporate lawyer to poverty lawyer—when the University of Maryland Law School asked him to join the faculty as the professor in charge of the school’s clinical education program. He soon turned that clinical program into oine of the vest in the nation. He also led some efforts to create new legal protections for the low income community—personally working with students on major cases. 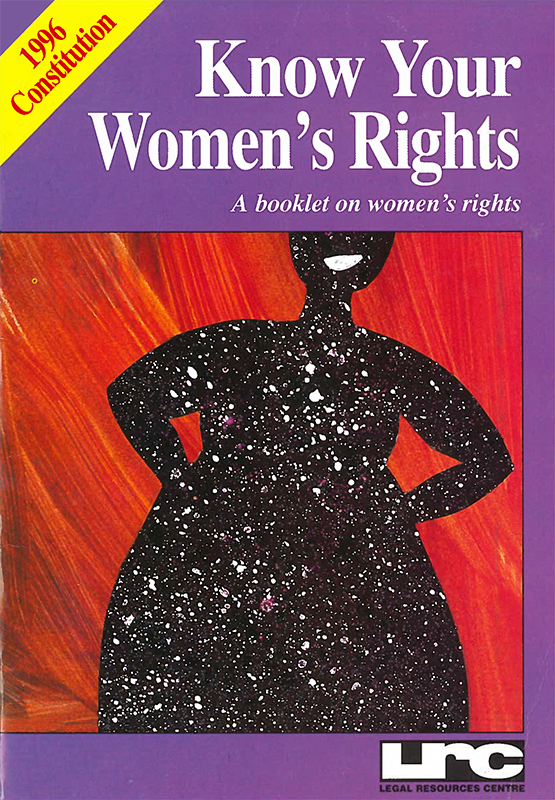 Legal Resources Centre and Trust, Know Your Women’s Rights pamphlet, 1996, Clint Bamberger papers, NEJL, GULL. Clint used his sabbaticals while a professor to be a two-way Johnny Appleseed. He spent six or seven month periods in the Netherlands, South Africa, and even Katmandu touting the virtues of America’s staff based legal aid system and its clinical education approach. But I say he was a two-way Johnny Appleseed, because he came back from some of these countries with a message for his home country. Many nations were willing to spend much more than the U.S. was on civil legal aid. And wherever he went, Clint made friends with those involved in legal aid in those countries. Over the years, Clint and I collaborated on several projects—among them the National Equal Justice Library. Clint made the first major donation of papers to the NEJL archives. And when I asked, he grabbed the laboring oar for a reunion of Reginald Heber Smith Fellows the Library held in 1998. Then a couple of years later he solicited my help in an effort by himself and a few other Maryland lawyers to promote the idea of a right to counsel in civil cases in that state. There is no direct line between that early fledgling effort in Maryland and today’s nationwide civil right to counsel movement. Yet, I am not sure it is entirely coincidental that the National Coalition for a Civil Right to Counsel is staffed by the Public Justice Center in Baltimore. 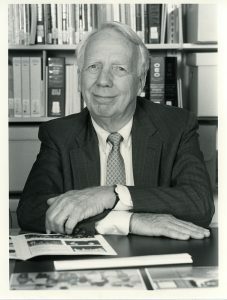 Clint Bamberger was a great man, worthy of joining the pantheon of legal aid heroes, many of whom the NLADA’s awards are named after, like Reginald Heber Smith and Arthur von Briesen. But he also was a great friend to many, including some in this audience I am sure. He and his wife, Katherine, often opened their home and their hearts to others, especially those who had any connection to legal aid and public service. Through their lengthy visits to law schools and legal aid organizations abroad, they also developed a worldwide network of colleagues and friendships. As a profession and a community, legal aid is far poorer for Clint’s passing, but richer, much, much richer for all he accomplished and all he was as a person. 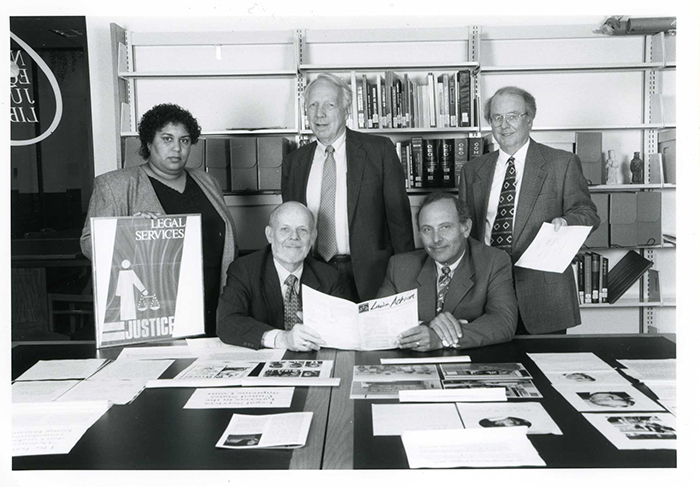 Clint Bamberger, Earl Johnson, Jr., Danna Bell-Russell, Claudio Grossman and Patrick Kehoe at the NEJL at American University in 1997. Photograph by Hilary Schwab. Clinton Bamberger Papers, NEJL, GULL. This entry was posted in General, History of Legal Services, War on Poverty anniversary on January 13, 2018 by Katharina Hering. As part of its 50th anniversary celebrations in December, New Jersey Legal Services published: Fifty Years Advancing Justice: New Jersey Legal Services’ First Five Decades. The beautifully designed brochure documents the history of New Jersey Legal Services and highlights its work product. The history includes a comprehensive timeline of the development of legal services in the United States, which incorporates the latest historical research. “Taken all in all, it constitutes a remarkable story of persistence and positive change,” states LSNJ in the foreword. New Jersey Legal Services also produced a 12 minute video: Our Journey: New Jersey Legal Services at 50 Years — Our Journey, which is also available on New Jersey Legal Services’ 50th anniversary website. This entry was posted in General, History of Legal Services, War on Poverty anniversary on January 3, 2018 by Katharina Hering. Georgetown Law Library’s Digital Initiatives and Special Collections Division recently supported the digitization of A Day of Justice, a 1976 co-presentation by the Legal Services Corporation, the ABA SCLAID and the National Legal Aid and Defender Association. 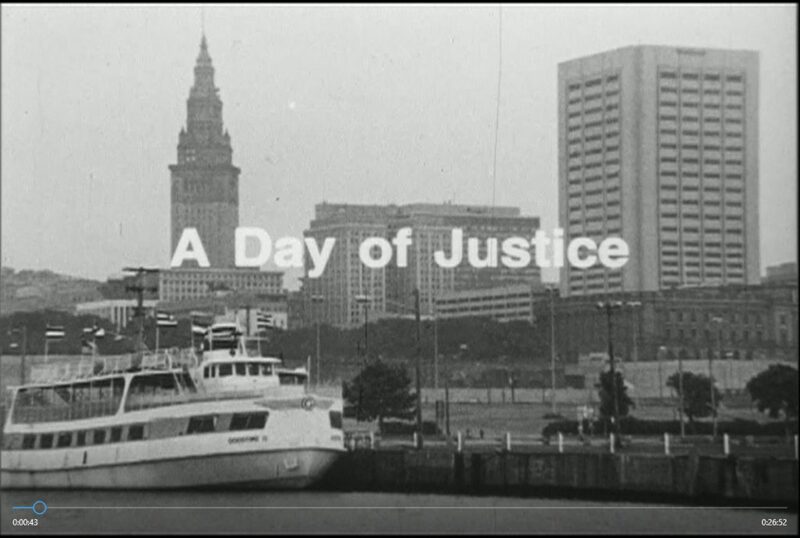 The film is a remarkable historical document that features photographs and audio recordings documenting scenes from a regular day in legal services offices across the country, including the Legal Aid Society of Cleveland, Ohio, the Taylor Law Center Legal Clinic in Knoxville, Tennessee, the Colorado Rural Legal Services program, the Greater Boston Legal Services program, the Legal Aid Bureau of Baltimore, MD, the Georgia Legal Services Program, the West Virginia Legal Services Plan, DNA Legal Services, Inc., and the National Housing and Economic Development Law Project in Berkeley, California. 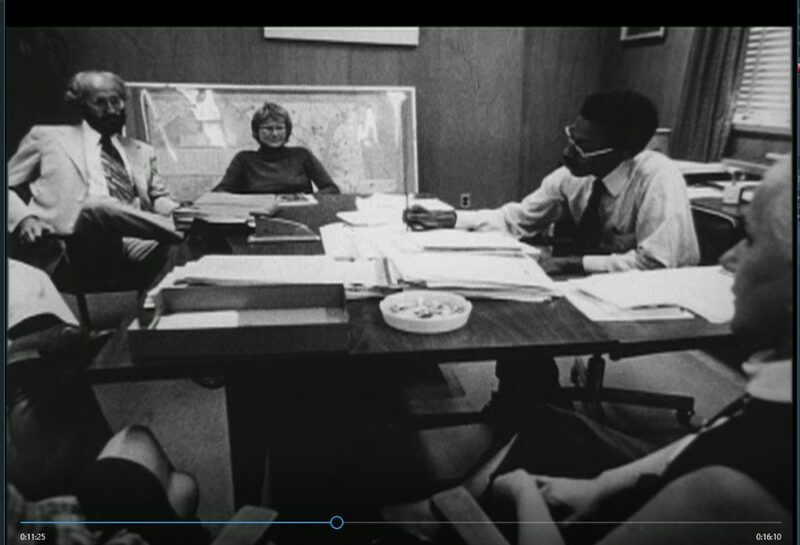 Screen shot from A Day of Justice (1976), showing the staff of the Legal Aid Bureau of Baltimore, MD at a meeting, including Charles Dorsey. Most of the cases were actual situations, filmed with permission of the participants. Some scenes were recreated by request of the lawyers involved. In all events, each sequence accurately reflected the work in legal services offices in the mid 1970s. The film incorporates photographs and narrated conversations with clients, attorneys, paralegals and staff at the different offices. 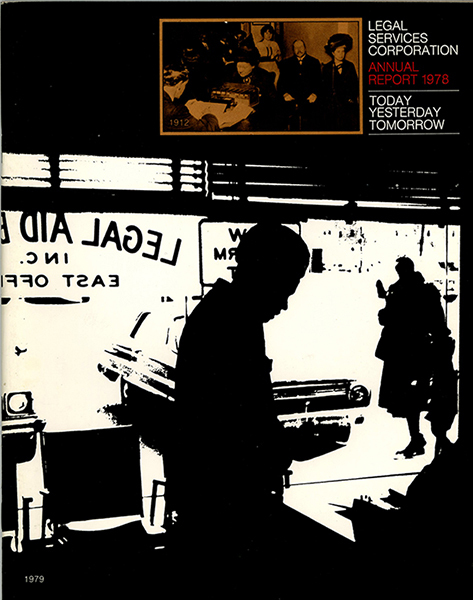 Screenshot from A Day of Justice (1976) showing a scene at the Taylor Law Center Legal Clinic in Knoxville, Tennessee. Harriet Wilson Ellis was the executive producer, and Ronald Capaleces produced, directed and wrote the film. 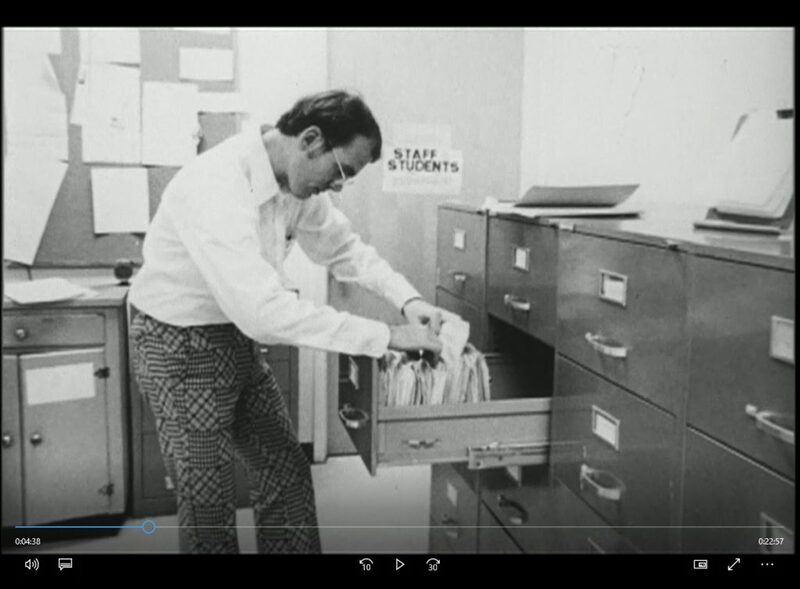 Please contact the NEJL Archivist for access to the digitized film. This entry was posted in General on November 17, 2017 by Katharina Hering. On October 25, 2017, Alan Houseman interviewed Richard Zorza on behalf of the National Equal Justice Library Oral History Project. Richard Zorza posted a segment from the interview on his Access to Justice blog. In the segment, which comes at the end of the interview, he offers this perspective on the future of access to justice. This entry was posted in General on November 5, 2017 by Katharina Hering. Please check out NEJL’s collection of permalinks to web pages documenting the histories of legal aid and defender organizations in the United States. Please contact the NEJL archivist if you suggest to add additional pages to this collection. This entry was posted in Bibliography, General, History of Legal Services, War on Poverty anniversary on September 30, 2017 by Katharina Hering. Check out NEJL’s short list of selected overviews of the history and organization of legal aid and indigent defense in the United States and internationally. The list was originally compiled for a program for the State Department’s International Visitor Leadership Program. This entry was posted in General on September 25, 2017 by Katharina Hering. Leo Sands, “The Rise and Fall of Poverty Law, 1960-1973,” MA Thesis, University of Cambridge, 2017. Available upon request at the NEJL. This entry was posted in acquisitions, General, History of Legal Services, Research, War on Poverty anniversary on September 1, 2017 by Katharina Hering.